Amazon has been ramping up its video streaming efforts by investing heavily into original content. A couple of years ago, Prime Video looked like an afterthought for Prime’s delivery subscription. Now, it’s a full-fledged service with a separate subscription. Starting today, non-Prime member can subscribe to Amazon Prime Video for $8.99 per month. You can cancel any time, you don’t have to subscribe to a year upfront. With an Amazon Prime Video subscription, you only get access to Amazon’s video library — no expedited shipping, no music library. When it comes to Amazon Prime, it still costs $99 per year. And yes, it still includes Prime Video (at least for now…). You can also choose to subscribe to Prime for $10.99 per month. You get access to expedited shipping, Prime Video, Prime Music, the Kindle Lending Library and probably a bunch of other stuff that I’m forgetting. This isn’t the first time Amazon is breaking out vertical subscriptions. Kindle Unlimited lets you access a larger library of books for $9.99 per month. But if you’re really interested in Prime Video, you should still subscribe to Amazon Prime as it’s a better deal. 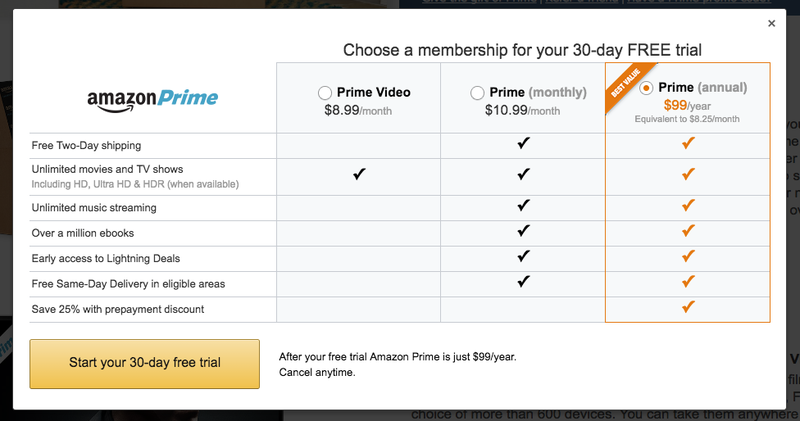 $8.99 per month represents around $108 per year just for Prime Video. For $99 per year, you get more stuff. With this new subscription offering, it’s easier to compare Prime Video with Netflix, which now costs $9.99 per month. Amazon wants to position itself as a cheaper alternative to Netflix, Hulu, HBO Now and all the other streaming services out there. Transparent, Mozart in the Jungle, the old Top Gear crew’s new show and Woody Allen’s next movie are all examples of Amazon’s important investments in original content for Prime Video. And today’s move might just be a first step before Amazon removes Prime Video from Amazon Prime. People will then have to pay for two subscriptions instead of one.